Well I has to ask the question. 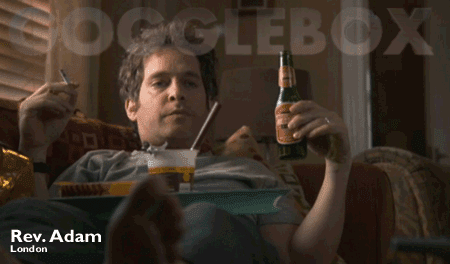 What is Gogglebox? I had heard people talking about it, and @revkatebottley is on it - so it popped up on twitter. From what I have picked up it involves people watching other people watch TV from the last week. This intrigued me - because I don't consume video this way. Yes I watch the news and some topical panel shows (funny or not). But I don't watch a lot of broadcast TV. When we sit down on the sofa we connect to one of the little boxes and watch Netflix, and sometimes iPlayer, and sometimes bought media streamed via Plex, and sometimes we sit with friends queuing up interesting, funny, new and old clips from YouTube. A whole lot more social than just watching TV. I admit it. I might swing by 4OD for a hit of Coach Trip (in case you think popular culture is entirely dead to me), and from time to time we channel surf, or watch an old episode of the Simpsons. But it cannot be escaped that broadcast TV is a fading media. The idea of watching TV when it is on rather than when we want it served up to us is slowly dying. For TV channels this means tough questions - do TV companies look to internet only delivery before Netflix and Amazon corner the market or does Broadcast TV hold on to a nostalgia market? The BBC seems to have a foot in both camps. Which brings me to Rev. Just as the #revsforrev hashtag was spreading more and more Revs were going off Rev. Arguments varied - a profound lack of encounter with God, an ecclesiastical version of the Brittas Empire without the jokes, a covert liberal plot to undermine signs of growth in the Church of England - or all three. I now suspect that Rev. is simply nostalgia. Much the same as All Gas and Gaiters and The Vicar of Dibley were in their generation. I love All Gas and Gaiters, but clergy of an earlier generation hated it because it was comedy based on a shape of ministry that was passing away. I enjoyed Dibley too - until I found myself in a small rural Parish - or 7. The final episode in this season of Rev. nails it home. The model of faith and ministry shown in Rev. is no more tenable than that presented in these previous series. Sorry but it has had it and it is over. Rev. may yet redeem itself. It may help the wider culture realise that this is not how church is and what it is about. Some of the congregation St. Saviours may start squatting in the Vicarge forming a New Monastic community, or find themselves worshipping in the school. Adam may come back profoundly renewed and transformed. I wonder if Netflix would be interested in buying the show?